So far, we’ve only seen a small slice of the newest Zelda game—but that’s enough to get some fans speculating wildly. As many of you already know, there is such a thing as a “Zelda timeline,” and it chronicles the different parallel Zeldaverses that currently exist, post-Ocarina of Time. Folks on social media and forums are also buzzing about Breath of the Wild’s timeline placement. So, what do we (think) we know? The most popular theory I’ve seen floating around, both on YouTube and other social media, is that Breath of the Wild takes place sometime after Wind Waker, potentially starring an old Link, not a new one (hence having to ‘wake up’ in the trailer footage in the first place.) The evidence is a variety of different things fans noticed during the Treehouse demo earlier this week. Could it be possible that the Koroks succeeded in their mission? Or are Koroks perhaps just a general staple of Zelda now, in the same way that elements like the Master Sword are? ...though it’s unclear on whether or not Amiibo functionality should really influence our understanding of the timeline. By that metric, every single Nintendo game exists in the same world simply because there’s Amiibo functionality. Or not! It could be so many different things from different games, like a floating city from Skyward Sword. It’s entirely possible that we see these different elements collide because Breath of the Wild is actually a convergence of different timelines. At the very least, given the ruin and worn-like nature of what we’ve seen thus far, Breath of the Wild seems to take place long after SOMEthing. 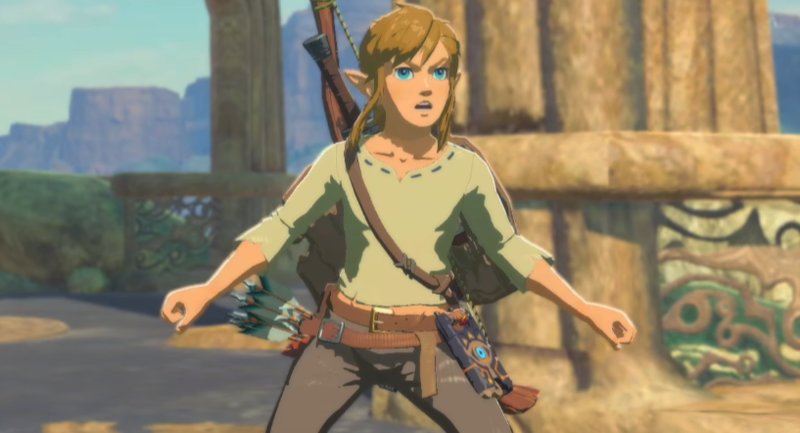 If nothing else, the theory about this being a previous Link seems on the money, and there’s definitely a connection to Ocarina of Time. I leave the rest of the theorizing to you, Zelda fans.